I enjoyed the Cusumano Nero d’Avola so much that I made a note to pick up any other bottle by the Cusumano brothers that I happen to stumble upon. The brothers have not only been diligently acquiring numerous vineyards in the western and southern regions of Sicily, in 2003 they opened their reconstructed 19th century family farmhouse which houses their offices and a brand new underground barrel vault cellar for aging. 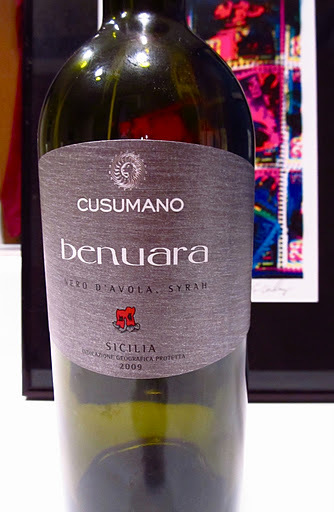 I was enthusiastic when I caught sight of and when I popped open the Cusumano Benuara 2009. 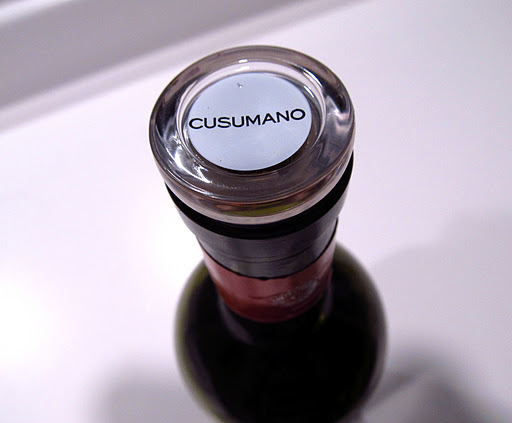 Like the Nero d’Avola, the Benuara also has a glass cork that I absolutely adore. Along with the contemporary fonts and stainless-steel like label, the overall effect is sleek and modern. The Benuara is one of the 3 proprietary red blends the family owned estate produces. As the winery recommends aerating for a bit to allow the wine to “collect itself”, I decanted it for about an hour. Garnet with ruby red highlights, aromas of plum and earthy grass emanated from the glass. The body was on the lighter side of medium with abundant flavours of blackberry and plum. Spicy black pepper started off the long finish, while snappy tannins and silky espresso notes shepherded in a pleasantly dry completion. Clean and fresh, the smoothness only increased and evolved into a suave mellow sip as my glass swiftly emptied.